Vintage Bollywood poster for sale of the hit Hindi film Night in London (1967). 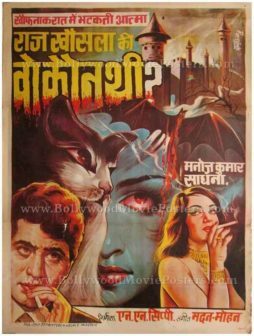 This is an actual surviving old Bollywood poster for sale of the 1967 thriller that featured Biswajeet and Mala Sinha in lead roles. Helen, Johnny Walker and Anwar Hussain also played supporting roles in the film. 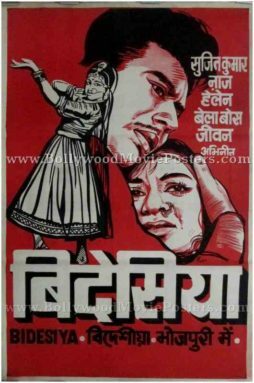 Printed and circulated during the original first release of the film (somewhere in the mid 1960s), this vintage Bollywood poster was printed for publicity of the film but never ended up being used. 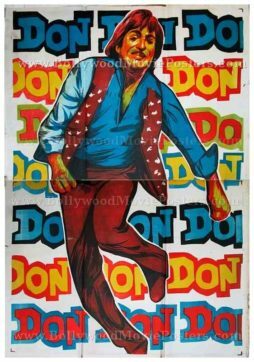 This old Bollywood poster for sale was originally designed in hand painted oil on canvas format by one of the best Bollywood poster painters of his time, V.G. Parchure. The printed signature of Bollywood poster artist V.G. Parchure is seen in the name of his art studio, i.e. “Pamart” on the bottom left of the poster. In this superbly hand painted Night in London Bollywood poster, artist V.G. Parchure’s mastery over the paintbrush is strikingly apparent. Actress Mala Sinha is seen in a stunningly realistic portrait holding a pistol in her hand. A large close up portrait of actor Biswajeet is seen blending in the background. The bottom of this Night in London Bollywood poster features Helen dancing to the iconic cabaret song “Mera Naam Hai Jameela.” A flying helicopter in the background of this Night in London Bollywood poster gives away the thriller plot of the film. 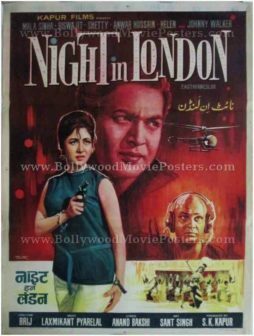 Night in London featured a successful soundtrack composed by Laxmikant Pyarelal, with lyrics penned by Anand Bakshi. Lata Mangeshkar and Mohammed Rafi sang memorable songs in the film. 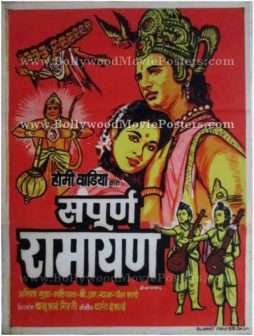 Vintage Indian mythology poster for sale of the old Bollywood movie, Sampoorna Ramayana (1961). This is an actual surviving old Bollywood poster for sale of the 1961 Indian mythology film that was directed by the pioneer of special effects in Indian cinema, Babubhai Mistry. This Indian mythology poster was originally designed and printed for publicity of the film somewhere in the late 1960s but never ended up being used. Sampoorna Ramayana was an Indian mythology film that chronicled the story of Lord Ram. This Indian mythology poster was originally hand drawn on canvas by a small time art studio in Kolkata giving it a very quirky appearance. Lord Ram and Sita are seen prominently in this Indian mythology poster in hand drawn portraits. Lord Hanuman and the evil ten-headed Ravana are seen in the background in smaller portraits. A vibrant red background is seen in this old Bollywood poster for sale giving it a very catchy appearance. The combination of yellow portraits set against a red background set an interesting contrast in this Indian mythology poster. 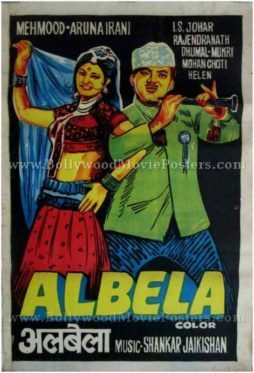 Original vintage Bollywood poster of the Madhubala film, Half Ticket (1962) for sale. 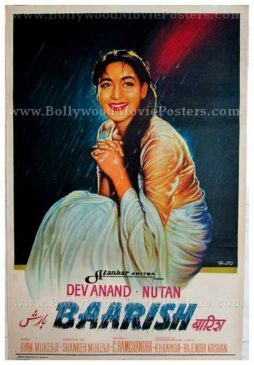 This is an actual surviving old Bollywood poster of the 1962 Hindi film which featured the most beautiful actress of all time in Indian cinema, Madhubala in the lead role opposite the most successful playback singer in Bollywood, Kishore Kumar. This old Madhubala poster was printed and circulated during the early release of the film (1960s). Originally designed for publicity of the film, this old hand painted Bollywood poster never ended up being used. A fabulous portrait of Madhubala applying make up is seen on the center of this hand drawn Bollywood poster. Kishore Kumar is seen alongside in a humorous avatar dressed as a young school boy in this Half Ticket poster, reflecting the comedy genre of the film. Half Ticket is a memorable 1962 Bollywood classic starring Kishore Kumar, Madhubala, Helen and Pran. 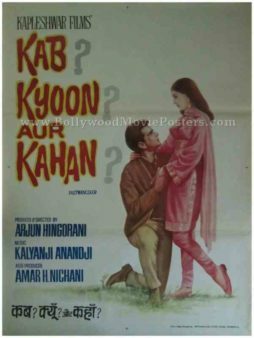 Original hand painted Bollywood movie poster of the hit Hindi thriller Woh Kaun Thi? (1964) for sale. This is an actual surviving vintage Bollywood poster of the 1964 black and white Bollywood movie that starred Manoj Kumar and Sadhana in lead roles. Woh Kaun Thi? is remembered till date for its super hit music. 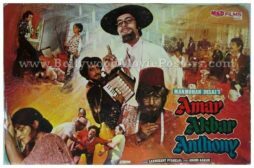 It featured the smash hit song “Lag Jaa Gale” sung by the nightingale of India, Lata Mangeshkar, making this poster highly collectible! 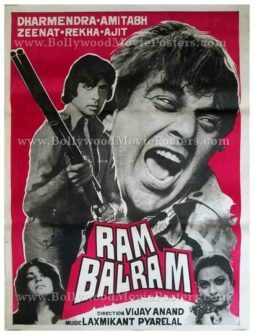 Printed and circulated several years after the first release of the film (1970s), this hand painted Bollywood movie poster was originally designed for publicity of the film but never ended up being used. This vintage Bollywood poster features quirky hand drawn artwork. Spooky elements such as an old castle, a vampire bat with blood dripping from its mouth, a cat and a mysterious female figure painted in blue are seen in this poster, giving away the thriller plot of the film. Manoj Kumar is seen in a hand painted close up at the bottom, smoking a cigarette. Woh Kaun Thi? is a 1964 black and white Bollywood movie directed by Raj Khosla, starring Manoj Kumar and Sadhana in lead roles. The film's success at the box office spawned two regional remakes in Tamil and Telugu respectively. 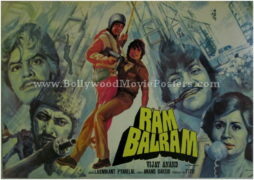 Rare vintage black and white Bollywood poster of the hit Hindi film Ram Balram (1980) for sale. 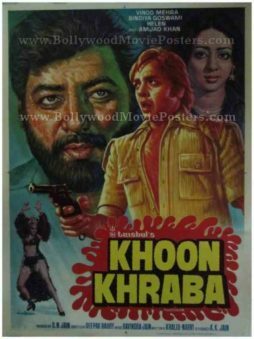 This is an actual surviving old Bollywood poster of the 1980 film that featured two of the biggest superstars in Indian cinema of the time, Amitabh Bachchan and Dharmendra. Printed and circulated a few years after the release of the film (somewhere in the late 1980s), this black and white Bollywood poster was originally designed for publicity of the film but never ended up being used. The poster features an interesting collage of black and white still photos from the film. 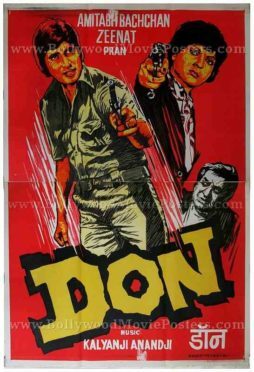 Superstar Amitabh Bachchan is seen holding a rifle on the left and a large close up of Dharmendra appears alongside on the right of this black and white Hindi movie poster. Zeenat Aman and Rekha, the two leading ladies are seen in smaller sized black and white still photos pasted at the bottom. Old hand painted, rare Bollywood pressbook of the Hindi film Geeta Mera Naam (1974) for sale. This is an actual surviving pressbook of the 1974 film that featured Feroz Khan & Sunil Dutt in lead roles. This vintage pressbook was designed in hand painted format (oil on canvas) by a movie poster artist working for a leading Bollywood poster design studio, making it very collectable! In this hand painted old Hindi film press book cover, anti-hero Sunil Dutt and lead protagonist Feroz Khan are seen locked in a sword fight at the bottom. A large side profile of the actress is seen painted on the left. 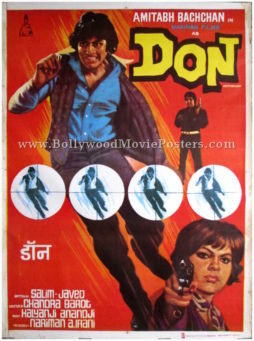 Typography used in the poster is primarily in English, with the film’s title translated in Devanagari Hindi as well at the bottom. Old Bollywood pressbooks are sometimes also referred to as song booklets, story booklets or synopsis booklets. They contain the lyrics of songs from the film in Hindi as well as in Urdu, and were designed to give theater audiences the chance to sing along while watching their favorite songs on screen. Old Hindi film synopsis booklets provide a further additional step of information – summarizing the plot of the movie as well as the star cast. Beautiful hand painted vintage Bollywood movie poster of the super hit Hindi film, Teesri Manzil (1966) for sale. Teesri Manzil is a 1966 musical thriller, starring the “Elvis Presley of India” Shammi Kapoor in the lead role opposite Asha Parekh. The film has become a timeless classic due to its fabulous music composed by one of the greatest composers in Bollywood, RD Burman. This is an actual surviving vintage Bollywood poster of the 1966 film, printed and circulated somewhere in the 1970s. This quirky, hand drawn vintage movie poster was originally designed for publicity of the film but never ended up being used. 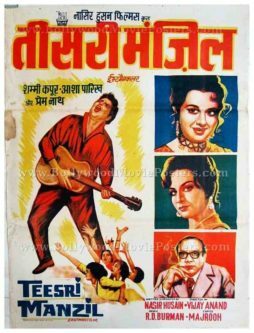 The poster features a hand drawn portrait of lead actor Shammi Kapoor in an Elvis like rock star avatar (accentuated with highlight streaks around him), performing on stage with fans reaching out to him from the audience. Typography used in the poster is a combination of Devanagari Hindi on the top and English on the bottom. This poster has been graded ★ As Is due to the stain seen on the left side of the poster. The overall condition of the paper is fair and there is minor taping / repair carried out on the reverse. 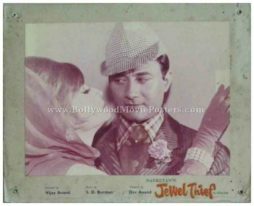 Teesri Manzil (Third Floor) is a 1966 Bollywood thriller starring the “Elvis Presley of India” Shammi Kapoor. Actress Asha Parekh plays the love interest of Shammi Kapoor in this film. In Teesri Manzil, Shammi is seen in his element, in a rock star avatar. During one of his musical performances, he sees a young woman from the third floor of the hotel, which is where the story unfolds into a murder mystery and lends its name to the film. The film became a hit and gained mass appeal at the time of its release. Songs from the film went on to become blockbusters and remain popular to this day. “Tumne Mujhe Dekha” by Mohammad Rafi, “O Mere Sona Re Sona Re” by Mohammad Rafi & Asha Bhosle, “O Haseena Zulfonwali Jaane Jahan” by Mohammad Rafi & Asha Bhosle and “Aaja Aaja Mein Hoon Pyar Tera” by Mohammad Rafi & Asha Bhosle are considered some of the greatest songs ever composed. 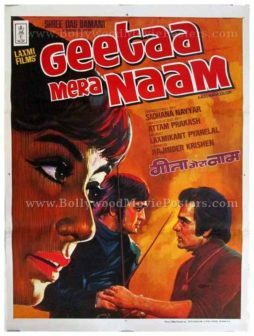 Highly collectible, hand drawn old Bollywood poster of the hit Hindi film Geeta Mera Naam (1974) for sale. 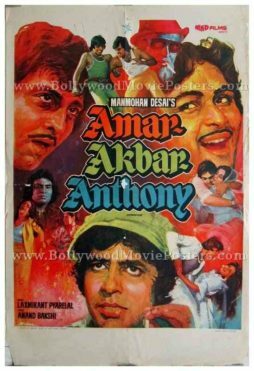 This is an actual surviving old poster of the 1974 Hindi film that featured Feroz Khan & Sunil Dutt in lead roles. 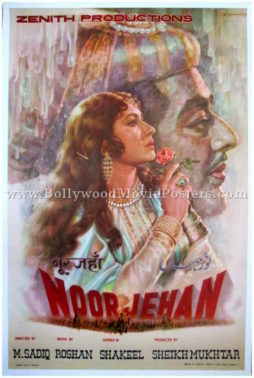 Printed and circulated during the release of the film, this old Bollywood poster was originally designed for publicity of the film but never ended up being used. Geeta Mera Naam is responsible for reviving the career of Sunil Dutt, whose acting career was at a standstill before this film was released. His role as a villain in the film won him mass appeal. The anti-hero Sunil Dutt and lead protagonist Feroz Khan are seen locked in a sword fight at the bottom. A large side profile of the actress is seen painted on the left side of the poster. 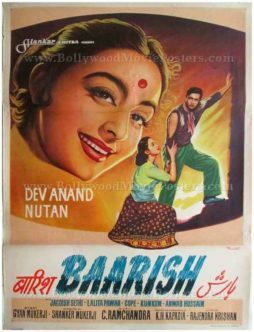 Typography used in the poster is primarily in English, with the film’s title translated in Devanagari Hindi as well at the bottom. 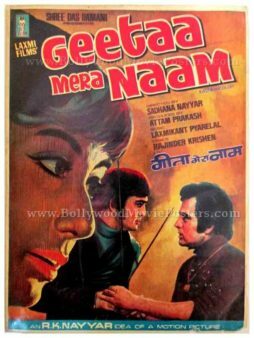 Geeta Mera Naam is a 1974 hit Hindi movie starring Sunil Dutt, Feroz Khan, Helen and Rajendranath. The film tells the story of four children who are separated at a fair and unknowingly reunite years later. 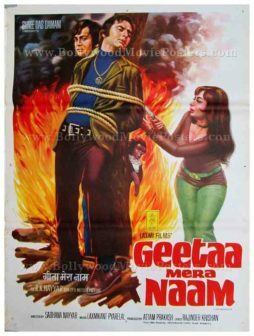 Highly collectible, hand drawn old Hindi film poster of the hit Bollywood movie Geeta Mera Naam (1974) for sale. This is an actual surviving old poster of the 1974 Hindi film that featured Feroz Khan & Sunil Dutt in lead roles. Printed and circulated during the release of the film, this hand drawn old Hindi film poster was originally designed for publicity of the movie but never ended up being used. This old film poster displays a dramatic scene where the actress is trying to rescue the hero of the film from burning flames (portraying the hero as weak and helpless whereas the woman is shown holding a knife and wielding power). 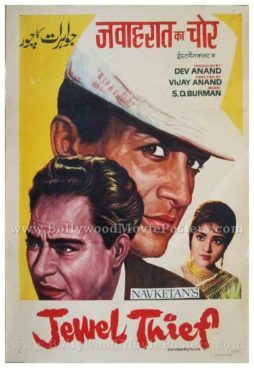 Very few hand drawn old Hindi film posters featured women in the driver’s seat of action, while the male protagonist appears helpless waiting to be rescued, making this rare gem a highly collectible piece.